Medical Holography is a technology that is used for visualization of medical images by creating a unique hyper-realistic experience. This technology allows complex 3-D structure’s instinctive comprehension offering empowerment to the clinicians. Medical holography is the process of forming a three dimensional image by the diffraction of light by the application of a photographic recording. Holography in medical science can be used for measurement of natural cavities inside the human body in a non-destructive manner. Holography in healthcare can be used for parallax and large focal depth imaging of internal body cavities as well as organs. Increasing demand for non-invasive medical procedures is expected to propel the medical holography market sturdily across the globe. Medical holography market is anticipated to record a significant CAGR of 30.4% over the forecast period. Medical holography market is expected to reach the value of USD 3.5 billion at the end of the forecast period. Currently the global medical holography market is observing a vibrant growth on account of increasing demand of holographic interaction technologies enabling less-invasive procedures in the market. Many multi-national companies are concentrating towards new product advances in medical holography. Moreover, the many advantageous properties of medical holography are exploited in the field of ophthalmology, dentistry, endoscopy and others now and then. New uses for medical holography in cardiac electrophysiology, radiological & surgical procedures are expected to drive the medical holography market rapidly. Advances in healthcare industry in the past few years and growing technological explorations are projected to drive medical holography market besides the wide range of functions of medical holography in an immense range of procedures such as urology, otology, orthopedics and others during the forecast period. On the basis of regional platform, global Medical Holography market is segmented into five major regions including North America, Europe, Asia Pacific, Latin America and Middle East & Africa region. As a region with a highly developed healthcare sector, North America is panned to observe substantial growth in medical holography market due to rising medical holography usage for cardiac electrophysiology and ophthalmology. Europe is expected to drive demand and positively impact medical holography market growth over the forecast period owing to increasing medical holography application for image processing and measuring purposes. The rising demand for medical holography for various processes in healthcare industry such as, X-Ray holography, endoscopic holography, multiplexed holography for medical tomography, study of tympanic membrane and others are expected to drive the market rapidly over the forecast period. The growing R&D activities associated to medical holography is further expected to increase the market growth on the back of discovery of new applications of it on regular basis. Application of holographic light-in-flight recording method adapted for implementing first-arriving light principle for imaging through human tissue, diffractive bifocal intraocular lens for geriatric population and numerous other uses of medical holography will further increase its market demand in the near future. Rapid urbanization with increasing disposable income, enhanced economic development has resulted in increase of medical expenditure which is expected to boost the medical holography market in the developed as well as the developing regions across the globe. Moreover, holography in dentistry provides expedient method of storing tooth prints, holography in otology offers potent techniques to study different parts of the human peripheral hearing organ and vibration behavior of models of the inner ear parts that is anticipated to contribute significantly in the growth of the medical holography market over the forecast period. Furthermore, holography in orthopedics offers study of orthopedic structures in a contactless manner, such as measure strains on fixation pins and rods, prevention of dislocations of both fractured ends for long bone fractures and much more. 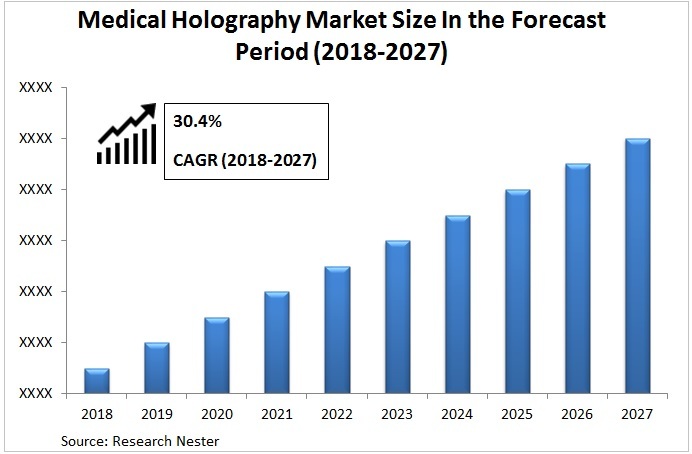 These extensive and valuable applications of holography in medical sciences with growing geriatric population around the globe from 7.64% in 2010 to 8.7% by 2017 as per the reports of World Bank are expected to drive the medical holography market during the forecast period. However, lack of awareness regarding new medical innovations and cost constraints associated to these methods of medical diagnosis and treatment is estimated to sluggish the growth of medical holography market across the under-developed and some developing regions of the world during the forecast period. Asia-Pacific (China, India, Japan, South Korea, Indonesia, Malaysia, Australia, New Zealand, Rest of Asia Pacific) Market size, Y-O-Y growth & Opportunity Analysis.